BSM desires to help Christians and Churches fulfill the Great Commission! This area is meant to provide you with some things from BSM that will help you to grow as a disciple and disciple-maker. There is no where else to start than with the Gospel and what it means to be a disciple of Christ. Here are 3 blog-articles on the Gospel and its implications for believers. Here is a 20 minute version, with background music, of a passionate message entitled "Our Motivation to Worship – The Gospel" (2010). A powerfully packed presentation of the Gospel from Exodus, Ezekiel, and Ephesians. What did you learn that you didn't know before? If not learn, did you gain any new insight? Has this blog-article/message impacted your relationship with Jesus? If so, how? What are your takeaways from this blog-article/message? Is there anything else in particular that stood out to you? Why? Here are 4 blog-articles that cover discipleship. These are not "discipleship how-to" articles. These are "discipleship comprehension" articles. These articles will help you better understand discipleship and how to walk it out. How has this blog-article/message spurred you in your relationship with Jesus and others? Did this blog-article/message reveal any areas you need to work on? If so, explain (what, why, and how)? Here goes a couple of blog-articles on how to share your faith simply and organically. Here goes a couple of blog-articles that will help reinforce that what we believe is believable, and how to reasonably defend why we believe what we believe as Christians; also, some blog-articles on defending what is biblical from what is not. Did this blog-article reinforce your faith in anyway? If yes, explain. Was their anything you can use in your defense of what we believe to true and sound? If yes, explain. What are your takeaways from this blog-article? Here goes a couple of blog-articles that will help you dig your spiritual roots deeper into what we believe, why we believe it, their importance, and their implications. Has this blog-article spurred you in your faith and/or relationship with God? If so, how? Here goes a couple of blog-articles that will help to biblically think through and rightly represent our faith in our hostile and sin-saturated culture. Does God Approve of Shacking Up? Can there be a Gay Christian? Political MMA Among Christians, Say It Ain't So? Did this blog-article challenge a view you held or reinforce a view you held? If so, explain. According to this blog-article, what does it look like to be a disciple of Jesus with a biblical worldview facing this cultural issue? 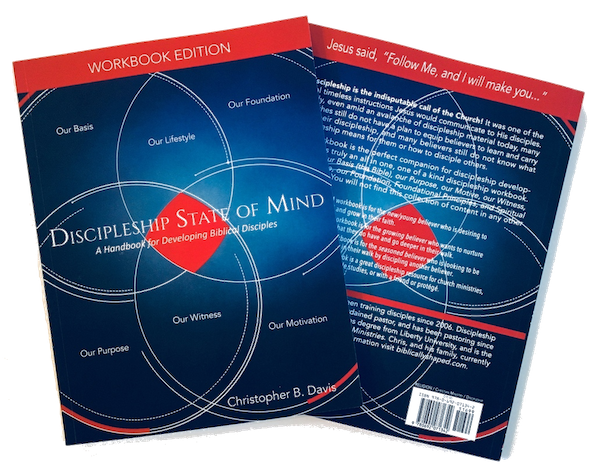 The Discipleship State of Mind Workbook is a great discipleship companion. It will help you develop all-around as a disciple of Christ. It will help you put together your own plan of discipling others. It is designed for you to use it to disciple others, either individually or in a group setting. You can use it in church settings—for small groups, discipleship groups, discipleship classes. There is no leader's guide or student guide. Everything you need is included in the workbook. Once you purchase it, you can use it for yourself and keep reusing it to disciple others. It truly is an all in one discipleship handbook.